Actor Anthony Mackie opened NoBar at the end of July. Who doesn’t like eating where a famous person laid their fork? Some restaurants wear their celebrity backing on their sleeves, like the well-known southern food joints owned by Justin Timberlake in New York City, music mogul P. Diddy’s soul food restaurants, and Michael Jordan’s steakhouses. 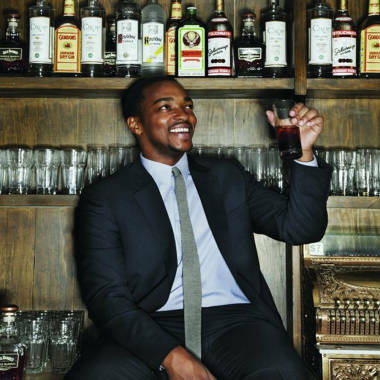 But did you know actor Anthony Mackie recently opened his own eatery in Brooklyn, or that media bigwig Ted Turner has a chain of restaurants all over the country? We aren’t sure why certain celebrities get into the food service game or what they want to accomplish, but whatever the reason, it’s sure fun to say, “Hey, I ate at Ashton Kutcher’s place.” With these nine under-the-radar joints, you can feel like you’re rubbing elbows with the stars. Tagine: Nestled comfortably in the heart of Beverly Hills, this unassuming Moroccan eatery has celebrity patronage in the form of actor Ryan Gosling, one of its owners. Star of award-nominated “Blue Valentine” and “The Notebook,” Gosling, who opened the place with chef Abdessamad Benameur, aka “Chef Ben,” is even rumored to occasionally wait tables when need be. Ted’s Montana Grill: Media mogul Ted Turner wasn’t satisfied with creating his own TV networks and racing yachts. He wanted to open a restaurant, and like many business-minded people, he overachieved, creating a chain that serves up classic American eats like burgers, crab cakes, french fries, and onion rings. While Turner’s restaurants don’t reach as far as his media empire, you can find them in Colorado, Montana, and across the East Coast. NoBar: Anthony Mackie, from “The Hurt Locker” and “The Adjustment Bureau,” opened a sleek new space in Bedford-Stuyvesant, a Brooklyn neighborhood with a notoriously dangerous past. But in tandem with the changing area, Mackie shows he too sports a new attitude. And unlike many of his celebrity counterparts, he will actually be cooking and serving his goods at the restaurant. Cabo Wabo Cantina: Best known for his lead vocals in Van Halen, Sammy Hagar has rebranded himself as the face and name of Cabo Wabo Tequila, as well as a number of nightclubs and restaurants by the same name in Nevada (plus one in Mexico). He thought up the name after watching a drunk staggering out of a bar ("cabo" is Spanish for “cape”; "wabo" is short for “wobble”). Now Hagar doesn’t need a band to star in his own show every night. 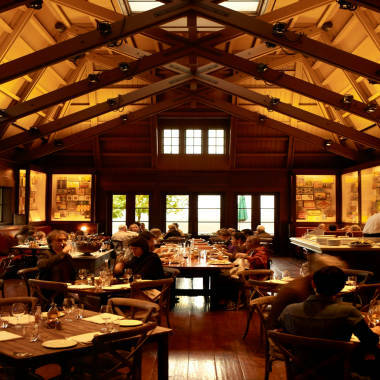 Rustic restaurant is owned by Francis Ford Coppola. Five Leaves: The late Heath Ledger wasn’t only a talented actor; he also had dreams of running his own restaurant. After his death, his estate covered the costs of opening his proposed space. Though he didn’t live to see his project through, now it’s a popular, homey restaurant in Greenpoint, Brooklyn, that serves dishes like Amish chicken and beet root ravioli. Rustic: Most people know about Francis Ford Coppola’s San Francisco eatery Café Zeotrope, but don’t know that he also has a swank restaurant less than two hours away in Geyserville, Calif. The eatery serves the famous director’s wines, some choice cocktails, and classic Italian-American fare. Dolce Enoteca e Ristorante: The only thing retro about this modern Italian joint in Atlanta is that some of its owners used to be on “That ’70s Show.” Yes, we are talking about Mr. Demi Moore, Ashton Kutcher, and Wilmer Valderrama. Now that these boys have grown up, clearly so have their tastes. Doug E. Fresh’s Chicken and Waffles: A hike up to Harlem in New York City is worth it to try the crisp and delicious fried chicken by Doug E. Fresh, aka Douglas E. Davis. Or better yet, get the chicken and waffles. No matter what you eat, you can be grateful that the hip-hop pioneer has finally opened the joint after two years of making his pubic wait.